I have reviewed your grievance appealing the decision of the Publication Review Committee to disapprove publication "MIM Prison - September 9 Day of Peace and Solidarity Study Pack". In accordance with Operating Procedure #803.2-Incoming Publications, approval to order or subscribe a publicaiton is not a blanket approval to receive the publication; each issue will be reviewed at the facility prior to delivery to offenders. The Warden or his desinee should disapprove any publicaiton for receipt and possession by the offender if it is on the Disapproved Publication List or it can be documented to contain material that violates Operating Procedure #803.2, as specifically listed in 803.2 Section IV (D). D. Material, documents, or photographs that emphasize depiction or promotion of violence, disorder, insurreciton, terrorist, or criminal activity in violation of state or federal laws or the violation of the Offender Disciplinary Procedure. I have considered your appeal of the Committee's decision and determined the Publicaiotn review committee disapproved the publication in accordance with Operatin gProcedure #803.2, Incoming Publications. Therefore, I am upholding the Committee's decision. Your grievance is UNFOUNDED. You have exhausted all administrative remedies. A week ago I had written to appeal the censorship of a publication, Under Lock & Key #51. Today I am writing to inquire about other mail that is going missing. From the reports we are receiving, no one at Chuckwalla Valley has received any mail from MIM Distributors in at least a month and a half. Mr. XXXXXX has filed an Inmate 22 form, and in his interview was told by A. Salas that the mailroom has not received any mail from MIM Distributors. I’m writing to find out what is happening to the mail sent by MIM Distributors to prisoners held at Chuckwalla Valley? And if it is being censored why is there no notification from your department of this censorship? I received your letter from 31 October 2016, in which you state that “All of Mr. AAAAA’s mail that has arrived at the Chuckawalla Valley State Prison Mailroom, with the exception of [SF Bayview Newspaper Vol 41 Number 9] has been routed to him in a timely manner.” Yet I have personally sent mail to Mr. AAAAA as outlined in my previous letter that he reports not receiving. I also have signed statements from Mr. AAAAA, Mr. BBBBB and Mr. CCCCC stating that they have not received Under Lock & Key #52, mailed out on 10 October 2016. Neither MIM Distributors, nor the above mentioned subscribers have received notification of censorship of any of these pieces of mail. Despite all evidence to the contrary, you continue to assert that the mailroom is delivering our mail to subscribers being held prisoner at Chuckawalla Valley State Prison. Meanwhile, Mr. AAAAA is having his 602 appeals related to these incidents rejected for bogus reasons. Therefore, I am forwarding documentation regarding these incidents to the addresses below in hopes of getting a satisfactory resolution to these barriers to our ability to speak, communicate and associate freely without state censorship. I will also be contacting individuals held at Chuckawalla Valley State Prison with this information and request that you ensure that mailroom staff deliver these letters to their intended recipients. The appealant is ppealing the decision of impoundment of his Under Lock & Key no 52 that was impounded at FSP on Octoer 18, 2016. The aforementione dpublicaiton was impounded at Florida State Prison on October 18th, 2016 for the following reasons: [see censorship record]. 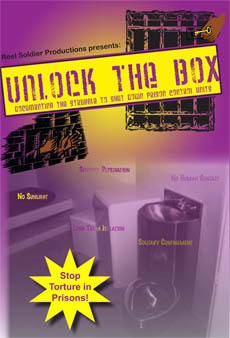 Under lock & key publicaiton promotes solidarity among oppressed, repressed and misled/undereducated prisoners. ULK is not a threat to any prisons security measures or daily function sof operations! 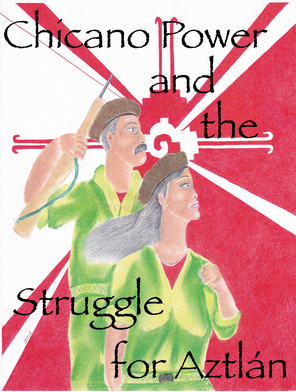 On the contrary , ULK publications promote peace and justice! Clearly the articles have been misinterpreted by whatever prison staff was assigned to read it. On November 15, 2016 the Literature Review Committee reviewed the subject matter content in question submitted by the institution. It was determined to contain subject matter that is inadmissible per Rule 33-501.401(3)(i)(m). The department may prohibit admission of materials or publication sif they are determined to be detrimental to the safety, security, order or rehabilitative interests of a facility or would create a risk of disorder at that facility. Chapter 33-501.401, requires that publicaitons be reviewed and a determination made by one institution. The determination made by that institution affects all other institituions; however, as a result of an individual institution's determination, all impounded publications are reviwed and either approved or rejected by the department's Literature Review Committee as required by rule. Therefore, the final determination is made by the depratment's Literature Review committee and not by an individual institution or warden. It is not within the inmate's scope of responsibility to determine what is a ivolation of Ch. 33-501.401, determine a credible threat to the security of a compound/facility or decide if an impoundment/rejection is friviolous. Based an the above information your your administrative appeal is denied. I have reviewed your grievance appealing the decision of the Publication Review Committee to disapprove publication "MIM Theory #7". In accordance with Operating Procedure #803.2-Incoming Publications, approval to order or subscribe a publicaiton is not a blanket approval to receive the publication; each issue will be reviewed at the facility prior to delivery to offenders. The Warden or his desinee should disapprove any publicaiton for receipt and possession by the offender if it is on the Disapproved Publication List or it can be documented to contain material that violates Operating Procedure #803.2, as specifically listed in 803.2 Section IV (D&F). F. Material that depicts, describes, or promotes gang bylaws, initiations, organization structure, codes, or other gang-related activity or association. I have reviewed the list of denied publications that is posted by the DOC Security Chief in Madison. This issue is listed as not allowed based on DOC 309.04 4 (c) 8b. Poses a threat to the security. Based on the fact that the denial was upheld by the DOC Security Chief, and after review by the ICE, WCI will also deny the publication for inmate possession. Based on the above information, inmate XXXXXX must dispose of the publication and contact the property department to facilitate that disposal. If he is appealing he will also need to contact the Property Department. I was denied delivery of my mail. 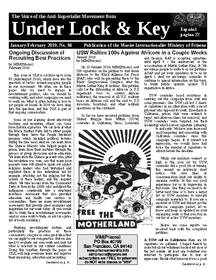 The July/August 2016 (#51) issue of Under Lock & Key. This publication is purely political and does not contain a threat to security. Please let me have my mail. The institution's decision reasonably and appropriately addressed the issue raised by this inmate. On appeal, the inmate presented no information to warrant a recommendation overturning that decision. per DAI this has been denied in accordance with DOC 309.04(4)(c)(8)(b). Thus, it is recommended this appeal be dismissed. I've read this publication many times before and never felt like I hda to start a riot because of it or anything like that. It's strictly political and a reviw of the material will support that you guys don't need to be this restrictive. It's not necessary. You guys are pushing too hard. A decision was made on your appeal and that decision is final. There will be no further review of that complaint. Your use of the "Request for Review of Rejected Complaint" form is misplaced. Your complaint was not rejected. it was dismissed. Once you receive a decision from the Office of the Secretary, that decision is final and there will be no further review.